It was a special treat when my Mother made chocolate cake WITH hot chocolate sauce, topped with a scoop (or two) or vanilla ice cream. I can vividly remember my Mother making the cake, putting it in the back porch to cool then making the sauce at the last-minute before serving. Don’t be stingy with the sauce. I love it when the cake soaks up the sauce and the cold ice cream compliments the yummy, chocolate-drenched cake. 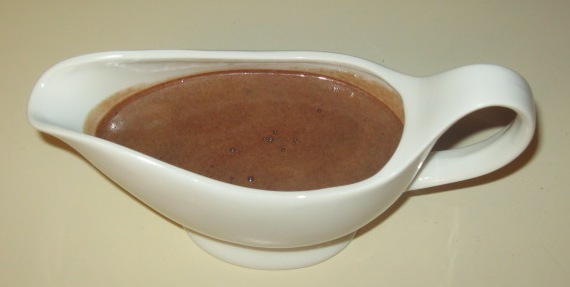 Wacky Chocolate Cake was popular during the depression since the recipe did not call for eggs, milk or butter all of which were scarce during the Great Depression. This cake, without the hot chocolate sauce, is a great vegan chocolate cake or good for those with sensitivity to dairy products. Just make sure the cocoa is dairy free! This weekend I made this for my daughters and their guys. I am certain I have not made this recipe for over 20 years but a flood of childhood memories came rushing back. I talked to my sister about the recipe and she recalls our Mother referring to the recipe from our Grandmother Mary Smaha. She also recalls that our Mother would say that you need to add enough cocoa powder to the dry mixture, to where it looks like cinnamon. After discussing this memory, we decided it would be fun to try adding a little cinnamon to the hot chocolate sauce next time. I’m not waiting another 20 years to try this version! Have a little chocolate cake with hot chocolate sauce today to celebrate your inner child and your fond memories! 1. Mix flour, sugar, cocoa, soda and salt. Add oil, vinegar, vanilla and water. Do not use a mixer and do not sift flour. Pour in greased 9×13″ pan. 2. Bake 45 minutes at 350 degrees. 1.Mix all ingredients together (except vanilla) and bring to a rolling boil. Boil 1-2 minutes. Remove and add vanilla and let set for a few minutes. 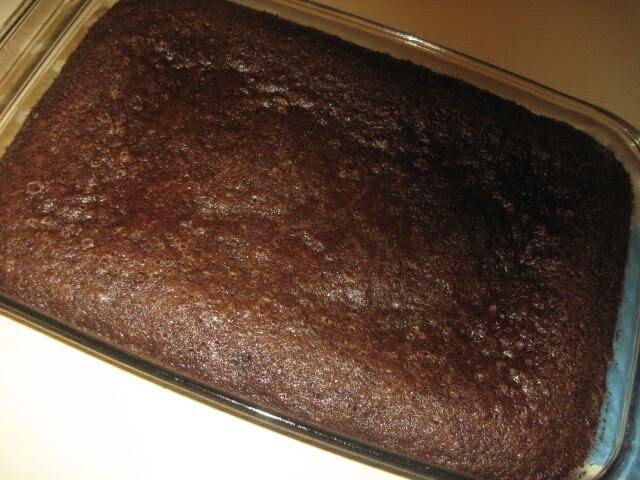 2.Serve warm over individual pieces of chocolate cake. This recipe is enough for an 8×8″ cake pan. Double the recipe for a 9×13″ cake.